A South Dakota historian will shed light on one of the most famous grizzly-bear attacks in the history of the American West at the June meeting of the History and Heritage Book Club. 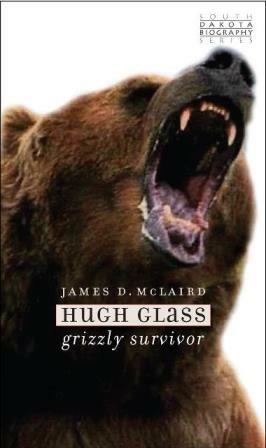 James McLaird of Mitchell will discuss his new biography of Hugh Glass, “Hugh Glass: Grizzly Survivor,” when the book club meets at 7 p.m. CDT on Tuesday, June 14, at the Cultural Heritage Center in Pierre. Everyone is welcome at the free program. The program will be broadcast live to Lemmon High School via the Digital Dakota Network, a videoconferencing network. Those at the Lemmon site will be able to see, hear and talk to McLaird. People interested in participating in the discussion at a location other than the Cultural Heritage Center are encouraged to call the South Dakota Historical Society Foundation at (605) 773-6006. It may be possible to use the Digital Dakota Network at a public facility such as a school to enable people to see, hear and talk to McLaird. Glass was a frontiersman who was left struggling for his life after being attacked by a grizzly bear in August 1823 along the Grand River near what is now Lemmon. According to popular legend, Glass crawled across the plains on a 200-mile journey back to civilization, intent on revenge upon the men who left him for dead. “The Hollywood blockbuster ‘The Revenant’ sparked interest in the story of Hugh Glass. McLaird has searched for the true story behind Glass,” said Michael Lewis, president of the foundation. McLaird is professor emeritus of history at Dakota Wesleyan University in Mitchell. He is the author of “Wild Bill Hickok and Calamity Jane: Deadwood Legends,” also published by the South Dakota Historical Society Press, and numerous articles about the Black Hills and the American West. Glass intrigued him, McLaird said, because of his interest in legendary people and events in the American West. McLaird said writing the story was a daunting task because few documents exist about Glass. Much of the book relates to how the popular tale emerged and has changed over time, McLaird said.